Works Engineering Steel Braided Brake Line Kit is made with TEFLON inner core, steel braided middle layer and then poly-coated outer layer for maximum durability and safety under harsh conditions. - Reduces braking distance during panic stop. Response time is shorten from the time the brake pedal is applied and actual vehicle deceleration. - Gives immediate brake pedal response. All brake pressure is applied efficiently to the brake callipers instead of expanding the stock standard rubber hose. - Eliminates brake pedal sponginess under heavy braking or when brake fluid is reaching a certain high temperature and vaporizing effect of brake fluid is starting to occur. - Provides compatibility with all brake fluids. International standards compliant and real D.O.T. conformance. 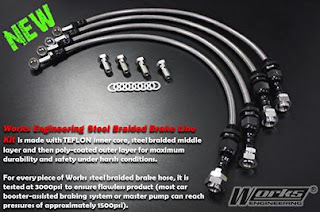 For every piece of Works steel braided brake hose, it is tested at 3000psi to ensure flawless product (most car booster-assisted braking system or master pump can reach pressures of approximately 1500psi).